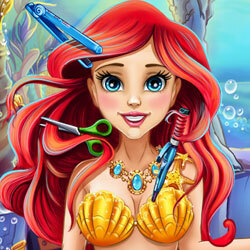 Description: The curious mermaid is on for a new haircut. Her gorgeous red hair is about to be cut, trimmed, curled, straightened and colored over and over again until you can find a hairstyle that really suits her. The princess was always amazed by new things and especially about human things, so she’ll really love your creativity. You’ve got limitless options, just create the most crazy and beautiful Real Haircut of them all and change the little mermaid's look into something stunning in Mermaid Princess Real Haircuts!